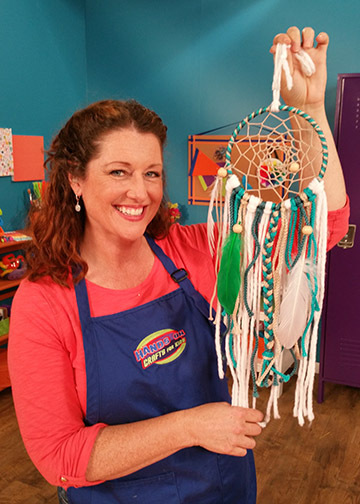 There's a dreamy new episode airing at Hands On Crafts for Kids this week: Jenny Barnett-Rohrs shows us how to make a simple and sweet dream catcher. Episode 1913 airing through Noon, EST, Friday, April 14th. Learn how to make this project as well as other CAMP themed crafts. Catch it today over on the Hands On Crafts homepage. Directions for this project is available on the Hands On Crafts for Kids website HERE. If you don't have all the items listed in video to complete your dream catcher, they may be able to pick up at your local craft retailer. This Dream Catcher Kit is available at select AC Moore and Hobby Lobby stores, or from HERE at Pepperell.com.